I love planning and organizing for trips. A 27-month adventure with the Peace Corps requires something very different than the usual trip, though. I was offered a position in Swaziland as a community health volunteer many, many months before departure. That meant nothing to me, though, because I knew that receiving medical clearance would be more difficult for me than securing the job. Because of that, I could not pack until I received clearance, which was about 3.5 weeks before departure. Talk about tying up every loose end, taking one last trip home, and packing on a deadline. Having lived in Swaziland for three months now, I think I did a pretty excellent job packing. I did not forget or have to leave behind anything crucial. I had two big packages sent after arriving with useful items, including kitchenware and a blazer and dressier shoes. 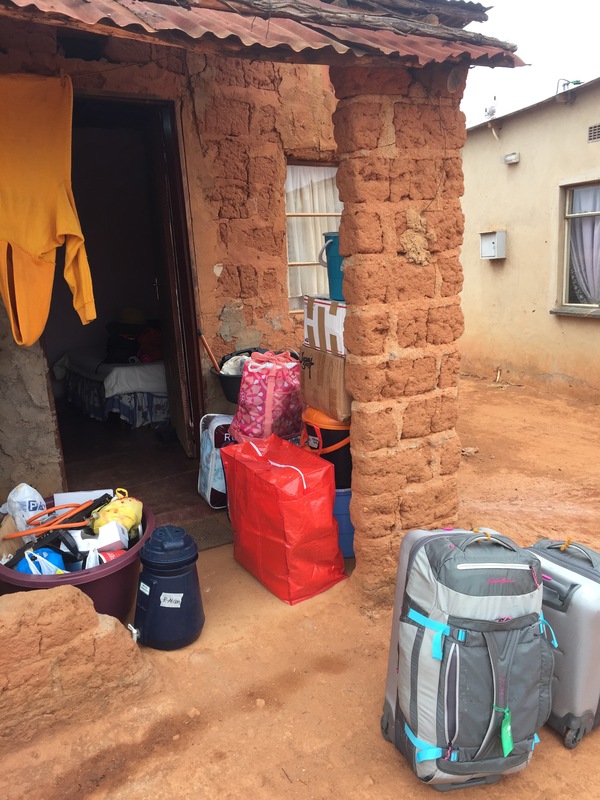 I packed enough of a variety of clothing and kitchenware to be satisfied and soon learned that most items are available in Swaziland. I was allowed to bring two checked bags, one carryon, and one personal item for my travel from New York to Johannesburg. We could pay for extra weight or an extra bag, and I seriously considered paying for a third checked bag. It would have been impossible for me to carry, but it would have been cheaper to pay for the bag than mailing everything I would have filled it with. I really did not want to be the person who brought three checked bags, though, which saved me a lot of struggle with maneuvering my bags. I had a really hard time carrying everything as it was, because I was not strong enough to heft my 50-pound backpack onto my back from the ground without dangling the bag from my left arm. Having either a chair or a friend to help was crucial. I even had an unbeknownst witness during much of my struggle because another Trainee from my group rode on the same shuttle as I did. I ended up arriving in Swaziland with a huge bruise on my left upper arm from the weight of my backpack. I would have struggled less if I had two suitcases to check like the rest of my group, a medium-sized backpack as a carryon, and then a small personal item. I did not want to buy any new luggage because I already owned a high-quality and durable suitcase and carryon in addition to the hiking backpack. All of my bags were just to the dimensions and weight limits. As a group, we realized that most checkin airline agents did not check the dimensions of our bags, and having bags with more wiggle-room would have been nice when packing for Pre-Service Training upon arrival in Swaziland. For PST, we have to leave one checked bag behind in the capital and find a way to cram all of our new materials into the baggage we have left. That was a challenge for me because my bags started out stuffed. I brought about 50 pounds of clothing and shoes and about 100 pounds of everything else, spread amongst a checked bag, my carryon, and my personal item. The most important thing I have learned about packing for the Peace Corps in Swaziland is bringing items you already like and use. There is no reason to waste crucial space and weight on things you will not use. You also need to bring a backpack or duffle for traveling because you will have to sit with your baggage on your lap while taking public transportation. Finally, having some kind of bags to separate items within your luggage has been stress-reducing. I love the quarter, half, and full bags from Eagle Creek’s Pack-It Specter Cube system. I roll my clothes and store like items together in each cube. You can even sign up for their pro deal with your Peace Corps acceptance letter to get 40 percent off your purchases. And remember that it does get chilly in Swaziland. It will be cold during PST and could be cold during winter at your permanent site. It will also cool off immensely when the rains come. The 98-degree high at my site on Friday became 65 degrees on Saturday and then 55 degrees on Sunday due to the rain and cloud coverage. I was bundled up in my puffy, a hat, and gloves, just trying to stay warm. Is there anything you wished you packed or did not pack for the Peace Corps? Check back for what clothing I brought, the list of home supplies, and what Peace Corps gives us. There’s also three posts on favorite items: for PST, my overall favorite things, and my cohort-mates’ favorite things. This entry was posted in Africa, Peace Corps. Bookmark the permalink. Thank you! I hope to travel to the Embassy soon to use their internet to upload more photos. I have so many!